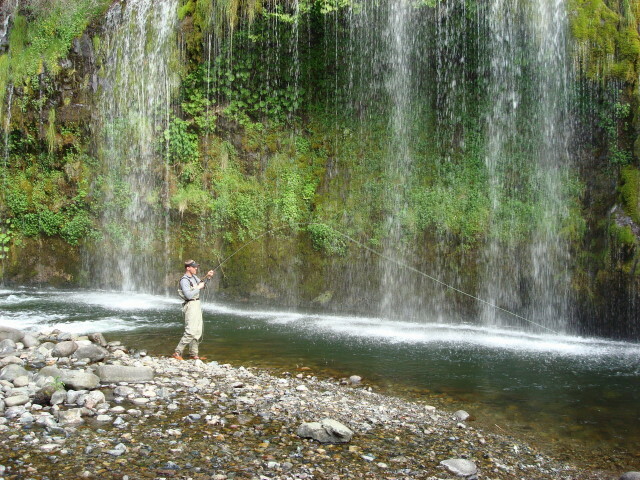 Fishing: With rivers and lakes full of a wide variety of fishes, some with extraordinary sizes. A typical day’s fishing may also include the bonus of seeing giant crocodiles, families of hippo, pink clouds of flamingos, exotic tropical fruits ripening on the trees near the water. Birdwatching: No other aspect of Ethiopia’s biology typifies its unique situation more than does its bird fauna. The extensive highland-island of Ethiopia hosts 862 known bird species, of which 23 are considered Endemic, limited within the confines of the Ethiopian borders, and some 225 winter migrants including 176 from the Pale-arctic. Eco–tourism: The best way to travel off the beaten track—to the outstanding natural sites in every part of Ethiopia, filled with numerous species of birds and animals that are native only to Ethiopia—is by trekking and camping. Owing to the growing need for responsible travel various ecotourism projects are underway in most part of the country. Safari Tours: Millions of years of isolation of exten sive areas with unusual conditions in the highlands of Ethiopia have led to the evo lution of unique species at all levels, especially those smaller spe cies less able to travel or be carried across inhospitable habitat. Other species from temperate regions have found a habitat similar to their usual homelands and have established populations here. 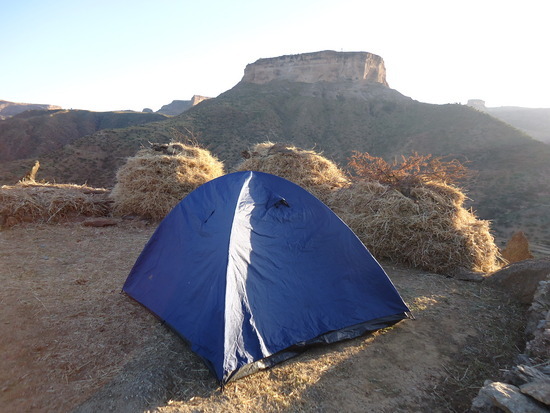 Camping: Camping often is the only way to see some of the more beautiful, but remote, areas of Ethiopia. With the increasing construction of some local hotels in nearby towns its also possible to get acceptable standard rooms in some remote areas. For those who intend to travel within national parks and to some of the more remote parts of Ethiopia camping is always a good option and exciting. Climbing: Ethiopia, an ultimate adventure with mountains and cliffs that are virtually unexplored, which offers astonishing and varied landscapes for any climber who likes the challenge of trying cliffs and mountains that are unexplored. 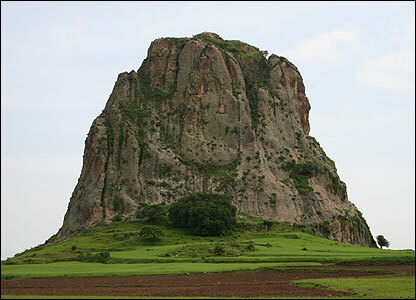 Much of Ethiopia is rugged mountainous country, and the opportunities to conquer demanding peaks and crag are endless. Trekking: Do you know that over 75% of Africa’s landmass (mountains) with above 3,000m meters and above are found in Ethiopia? Blessed with this grand mountain scenery and a temperate climate, the Ethiopian highlands offers one of Africa’s finest high mountain trekking opportunities. Among the most famous trekking highlands in Ethiopia include the SEMIEN MOUNTAINS, Bale Mountains. Hiking & Walking: The Ethiopian highlands, blessed with a temperate climate and grand mountain scenery, offer superb hiking and trekking opportunities. The principal well-established areas for hiking and walking is the Bale Mountains National Parks. Recently Western highlands & the Omo valley, where strong and colourful cultures compliment the appeal of scenery, flora, and fauna. Water Sports: Although water sports are not quite common in the country, for those interested in rafting, kayaking and canoying, Ethiopia offers an unspoiled environment for white water rafting and other sports. 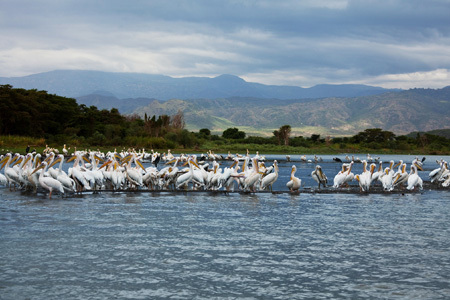 The Omo River, rated as one of the world’s great rafting trips, has a challenging whitewater, abundant wildlife, excellent birds, superb scenery, and some of the most unique unvisited people in Africa. Caving: The fantastic limestone caves of Sof Omar is one of the most spectacular and extensive underground cave systems in the world. The Sof Omar cave system is one of the most spectacular and extensive underground caverns in the world. Formed by the Weyb River as it changed course in the distant past and carved a new channel through limestone foothills, the 16 km cave system is an extraordinary natural phenomenon of breathtaking beauty. The Food: Ethiopian cuisine is one of the world’s best kept secrets. Ethiopian food is an exotically spicy mix of vegetables, slow-simmered meat or grain stews, and fresh meat sautés. Ethiopian dishes are prepared with a distinctive variety of unique spices, which lend an unforgettably striking dimension to its exotic cookery. Grains like millet, sorghum, wheat and ancient teff , a tiny round grain closely resembling millet, form the basic breadstuffs of the diet. Most farming in Ethiopia is subsistence, so the vegetables and animals are often grown and raised at home. The ancient practice of beekeeping produces exquisite honey. It is fermented to make tej, the Ethiopian honey wine. Essential components of Ethiopian cooking are berbere, a spicy red pepper paste, niter kibe , a spice-infused clarified butter, and injera. Injera, the sourdough pancake-like bread of Ethiopia, is made from a fermented sourdough teff. Most traditional dishes have a stewy consistency. Alicha indicates a mild stew while Wot are stews with the spicy flavor of berberé. Sautéed meats add to the variety of a meal. Dining in Ethiopia is characterized by sharing food from a common plate, signifying the bonds of loyalty, family, and friendship. 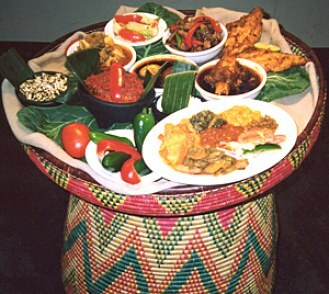 The traditional Ethiopian meal is served on a large platter that is draped with the crepe-like injera bread, with the selection of foods decoratively arranged around the center dish. To eat, diners simply tear off a piece of injera, use it to scoop up some of the various dishes and pop it in their mouths. The whole thing is a communal affair and is eaten using your hand. Some Ethiopian girls will even hand-feed you. This is a common Ethiopian tradition of welcoming tourist and guests to their home. Ethiopian Airlines, the first African airline to operate the 787, has trained eight pilots on the 787 Dreamliner at the Boeing Flight Services campus located at Gatwick, London. Additional batches of trainees are conducting 787 training in the same facility. Boeing has been granted approval by the U.S. Federal Aviation Administration (FAA) to provide flight training for pilots preparing to operate the new Boeing 787. With 787 training, pilots can transition to the new airplane in five to 20 days, depending on previous pilot experience. Boeing 777 pilots can qualify to fly the 787 in as little as five days, given the high level of commonality between the two airplane types. “This is an important milestone in the history of Ethiopian Airlines,” said Captain Desta Zeru, Senior Vice President of Flight Operations for Ethiopian Airlines. “Our pilots are now qualified as the first African pilots to fly the 787. “We are proud to support Ethiopian Airlines as they grow their business with the 787 Dreamliner,” said Roei Ganzarski, chief customer officer, Boeing Flight Services. “World class training for a world class airplane is part of the Boeing Edge we work hard to provide to our customers.” The Boeing 787 flight training program uses an innovative suite of training devices including a full-flight simulator, flight training device and desktop simulation station to ensure that pilots are ready to fly the Dreamliner. Ethiopian is a multi-award winner for its commitment and contributions towards the development and growth of the African aviation industry and in recognition of its distinguished long-haul operations enhanced by the introduction of new routes and products. 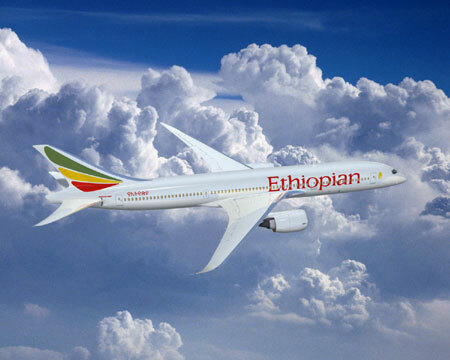 Recently, Ethiopian won Gold in the African Airline of the Year 2011/2012 Awards organized by the African Aviation News Portal. Ethiopian also received the 2011 AFRAA award for being consistently profitable over the years and has won the “AFRICAN CARGO AIRLINE OF THE YEAR 2011 Award” for its excellence in air cargo. Ethiopian also won the NEPAD Transport Infrastructure Excellence Awards 2009 and “the Airline of the Year 2009 Award” from the African Airlines Association (AFRAA). 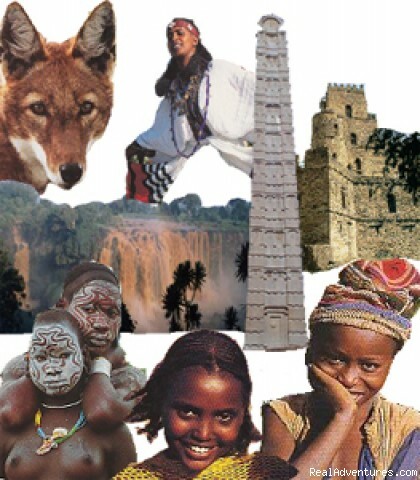 Ethiopia is a unique travel destination with numerous attractions that cannot be found anywhere else in the world. However, despite being an enchanting country Ethiopia delights remains unknown to most travelers; hence many connoisseurs consider it to be Africa’s best-kept secret. Ethiopia is blessed with an astonishing contrast of nature’s gifts. 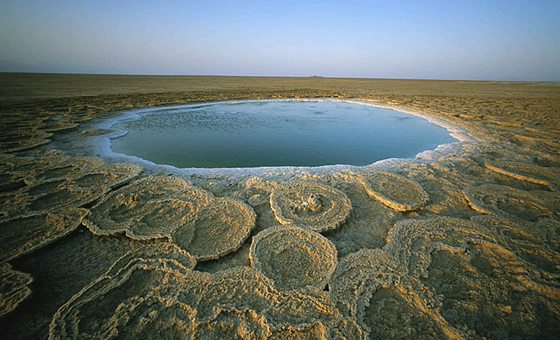 This ranges from the heights of the jagged peaks of the Simien mountains- a UNESCO World Heritage Site, the bird filled rift valley lakes, to the undersea level lunarscape of the Danakil Depression. Travelers have plenty of opportunities to enjoy mountain treks, caving, camping, sailing and white water rafting adventures. Though not as abundant as elsewhere in Africa, Ethiopia has plenty of wildlife – including 31 rare species. 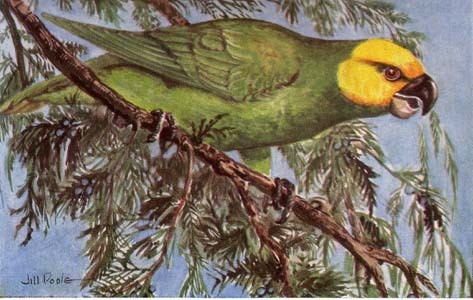 Ethiopia is also one of Africa’s great birding destinations and 861 species have been recorded of which 16 are endemic. Most overseas visitors will start off from Addis Ababa. Addis, as the city is popularly known by its aficionados is the capital city and home to Bole International Airport. The city rests at the foot of the Entoto Mountains. Addis Ababa means New Flower and its foundation are credited to Queen Taitu – consort to Menelik II. While in Addis, make sure to visit the Ethnographic Museum and the National Museum. The Giorgis Cathedral, which was built in 1896 to commemorate victory over Italian invaders, is also worth a visit. The Simien Mountains National Park is much favored by trekkers as it boasts some of the scenic sights in Ethiopia. The mastiff reaches to 4620m, the highest point in the country. The park was created to protect the Walia Ibex, which is found only in Ethiopia. Other endemic animal species in the park are Gelada Baboon and Simen Fox. Bale Mountains in the south-east, though less accessible, has trekking opportunities and some wildlife including a few endemic species. 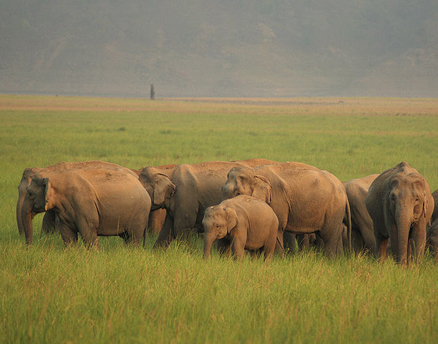 Awash National park, said to be one of the finest and most accessible reserves in the country, is also worth a visit. The Awash River strides the park before heading to the Dankil depression where it vanishes, never to reach the sea. Some special attractions in the park include the Awash Falls, the dormant Fantale volcano and some thermal springs. Forty-six species of wildlife have been identified here and the bird life is prolific. The park is located just 211 km to the east of Addis Ababa. Regarding historical attractions, Axum, is key stopover on the historical routes. The ancient city, dating back at least 2,000 years, is particularly important in the history of the Orthodox Church as it was the seat of King Azena when he converted to Christianity in the 4th century AD. Every year, the site known as Queen Sheba’s bath is the focal point of the ceremony of Epiphany. 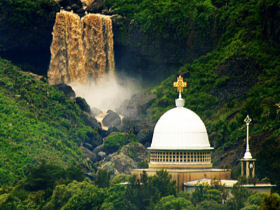 Axum is also known for the 17th century Cathedral of St Mary of Zion. Legend has it that the original Ark of the Covenant is housed here. The monks jealously guard this treasure and do not allow anybody to view it. This stand has led to much speculation that this object of immeasurable historical and religious value may not actually be in the hands of the monks of St Mary of Zion. Other historical attractions in Ethiopia include Lalibela and Gonder. The best time to visit Addis Ababa and the highlands region is the dry October – June period. The traveler is advised to dress very light in the lowlands and desert country. In the highland region, temperatures average 16°C and warmer clothing comes in handy at night and early morning. The St. George church in Lalibela, dedicated to Ethiopia’s patron saint, is one of 11 Ethiopian Orthodox churches that were carved out of the rock in the 13th century and are literally anchored in the earth. ON the roads through Ethiopia’s highlands traffic raises a brick-red haze that coats your clothes, powders your skin and starts a creaking in your lungs. Despite the dust people wear white. Farmers wrap themselves in bleached cotton. Village funerals look like fields of snow. At churches and shrines white is the pilgrim’s color. I wear it too, protectively: long-sleeved white shirt, tennis cap, Neutrogena sun block. A pilgrim? Why not? I’m here for something I’ve longed to see, Ethiopia’s holy cities: Aksum, the spiritual home of this east African country’s Orthodox Christian faith and, especially, the mountain town of Lalibela, with its cluster of 13th-century churches some 200 miles to the south. 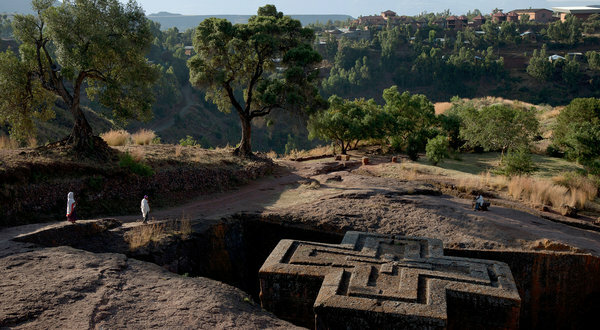 Lalibela was conceived as a paradise on earth. And its 11 churches, cut from living volcanic rock, are literally anchored in the earth. In scale, number, and variety of form there’s no architecture or sculpture quite like them anywhere. They’re on the global tourist route now, though barely. 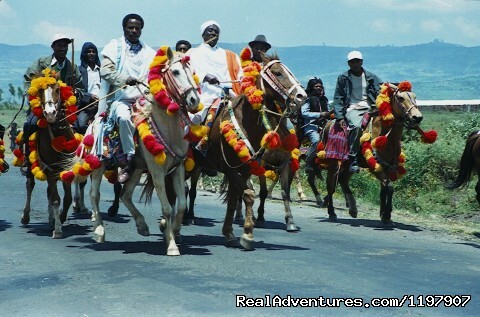 To Ethiopian devotees they’ve been spiritual lodestars for eight centuries, and continue to be. Heaven seekers and art seekers are, in some ways, kindred souls, impelled to spend precious time and travel mad distances in search of places and things that will, somehow, fill them up, complete them. For the religious, pilgrimage is a dress rehearsal for salvation. For the art seeker, it can transform a wish list of experiences into a catalog of permanent, extended, relivable memories. But why do art seekers go to the particular places and things they do? This is a personal matter; complicated, with roots in the past. As an American teenager in the early 1960s I sensed Africa all around me, secondhand. African independence was on the evening news; names like Lumumba, Nkrumah and Senghor chanted by jubilant crowds. “Civil rights” was turning into “black power,” with preachers in suits replaced by Huey Newton holding a spear in one hand, a shotgun in the other. In college I took an anthropology course called “Primitive Art.” It met in an ethnological museum that had a collection of masks from West and Central Africa. I loved them instantly, these things made for dancing, healing, telling stories, changing identities. They looked old but felt new. I wanted to go to where they came from. But not ready yet, I went that first college summer to Europe, where I dashed through countless museums in 15 countries before ending up in Istanbul. Again, love, immediate. One look at Byzantine art — the lifting-off dome of Hagia Sophia, the Buddha-calm saints of the Chora mosaics — confirmed what I had begun to suspect: my compass was not set westward. At that point I didn’t yet know that Byzantium and sub-Saharan Africa had once fruitfully intersected. I later learned, and that intersection is what I’ve come to Ethiopia to see. The history of Ethiopian culture is deep, going back — if the national epic, the “Kebra Negast” or “Glory of Kings,” can be believed — to at least the 10th century B.C., when an Ethiopian ruler, the biblical Queen of Sheba, traveled to Jerusalem in search of the wisdom of Solomon. The two monarchs met, bonded and had a son, Menelik, who would become Ethiopia’s first emperor. Solomon, the story goes, wanted to name Menelik as his heir. But the young prince, with Africa on his mind, left Jerusalem behind. He did not, however, leave empty-handed. Secretly he took with him the Ark of the Covenant, which held the tablets given by God to Moses, and brought it to Ethiopia, in effect, establishing a new Israel there. History, if that’s what this is, then fades out for stretch, until around 300 B.C., when a new empire coalesces in northern Ethiopia, with the city of Aksum as its capital and a still-existing group of immense stone stelae, carved with architectural features, as its grand monument. Another fade-out. By the fourth century A.D. Ethiopia has become officially Christian, and the Ark is in Aksum, enshrined in a cathedral named St. Mary of Zion, where it remains. 1. Convenient One-Stop Shopping Travel agents can handle every aspect of your trip from airline tickets to lodging, ground transportation, activities, tours and more. 2. Consumer Advocate If you should have a problem during your trip, travel agents can act on your behalf to see that proper restitutions are made. 3. Expert Guidance Travel agents are experts in helping travelers get where they need to go and in helping to create possibilities most people never would have dreamed were possible. 4. Save Time Avoid the headaches and let the travel agents call around and do all the time consuming work of planning a complex itinerary. 5. Choice Travel agents offer you an array of options and price quotes from a variety of travel suppliers, giving you the upper hand when making your final travel decisions. 6. Less Stress Planning a trip can be stressful. There are so many options and details to worry about. Travel agents do the work, resulting in less stress for you. 7. Updated Information Travel agents are constantly communicating with the travel community, thus giving you the most up to date info on airlines, hotels, car rental agencies, travel visas, and other travel services to consider as you plan your trip. 8. Customer Service Travel agents offer that “personal touch” to your travel planning experience- Offering help and advice that a website cannot provide. 9. Travel Documentation Travel agents can help you to prepare and organize any necessary documents that you may need in order to travel outside of the country. They can direct you to your local passport office, and they know where you need a visa, as well as any other documentation that you might need along the way. 10. Travel Expertise Many travel agents are considered experts in the area you are traveling to and have probably already been to your chosen destination. 11. Best Value for Your Money Spent Travel agents can help you to make your dollars go farther while you are away. They have access to finding all sorts of deals ranging from flights to hotels to dinner recommendations. 12. Location, Location, Location!!!! Travel Specialists can help you to find a place to stay pretty much anywhere you desire. If it’s a hotel with a view of the ocean in Hawaii or a jungle hut in the Nilgiri foothills, a travel agent can help you make it happen. 13. Knowledge of All the Ins and Outs Travel specialists can help bring you up to speed on the local laws and regulations of wherever your travels take you. 14. Credentials Travel agents attend all sorts of seminars and classes to prepare themselves for trip requests like yours. 15. Tourist Attractions Travel agents can give you a list of all the not-to-miss spots: such as amusement parks, museums, nature preserves, and historical locations. 16. Avoid International Flight Confusion Travel specialists can help organize those confusing international flights that internet search engines don’t cover. 17. Where to Go With Kids Travel agents can help you to find great locations that are kid- friendly. 18. Trip Cancellation Something has come up and you need to cancel your trip? If you have used a travel agent they are the only person you need to call. 19. Travel Insurance With all the countless options for travel insurance these days, it can become confusing. A travel agent can help you pick which package works best for your needs. 20. Personalized Trips A travel agent can prepare you a personalized trip based on where you want to go and what you want to do. 21. Where to Go to Avoid Kids Want to go somewhere without children running all over the place? A travel agent can help you to find excellent retreats that are open to adults only. 22. 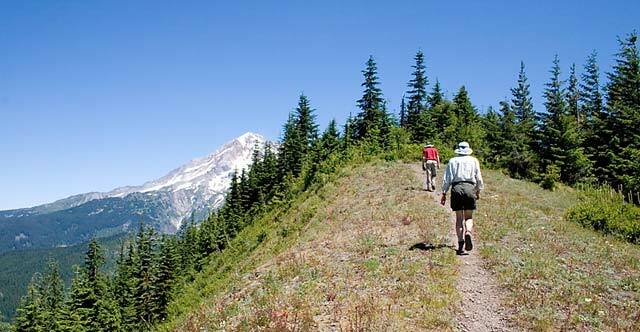 Good Senior Trips Need a trip with a good balance of sight-seeing, rest and relaxation? Travel agents can help lucky retirees plan great extended trips that are senior-friendly. 23. Student Discounts Some travel agents are an excellent go- to source for students looking to go on discounted trips. 24. Exotic Adventures Travel experts can help to recommend great once in a lifetime experiences. They can help you to find the best/safest shark cages to dive into and the highest free-fall bungees to jump off. 25. Great Deals without Sitting at a Time Share Presentation Want an affordable trip to Florida without having to sit through a timeshare presentation? A travel agent can help you to exceptional deals without the stipulations. 26. What to Eat Where are all the top chefs at your destination? Travel specialists give great advice on the best restaurants to hit on your trip. 27. What Not to Eat Leaving your home country and not familiar with the new language? Travel agents can help give you some forewarnings so you don’t accidently order the local delicacy (which may or may not be specially prepared bugs) without meaning to. 28. Local Traditions Travel specialists can update you on all local traditions and customs of places you are visiting, so you make a good impression. For example, in Japan many people expect their visitors to take their shoes off before entering their homes. 29. Local Laws Many countries have laws that are very different from your own. Travel agents can help give you a quick rundown of what you need to be aware of before you go. 30. Busiest Travel Times to Avoid If you want a quiet trip, travel experts know what dates you should avoid and can help you plan your trip accordingly. 31. Avoid Unexpected Expenses Travel agents will be able to inform you about expenses you will incur on your trip, even ones you might never expect. 32. Exchange Rate Knowledge Travel agents are knowledgeable of the countries where your dollar can go further. 33. Useful Travel Books to Have with You A travel expert can give you advice on what travel books are the most useful to have with you. Some of these books list restaurants, customs, and small amounts of the local language. 34. List of Not- to- Miss Places Travel specialists can give you a great list of not- to- miss hikes, waterfalls, and cliffs that may or may not be published elsewhere. 35. What to Wear Many restaurants have different types of dress codes. If you are interested in dining at specific places on your trip, your travel expert can advise you on appropriate dress wear for the occasion. 36. What Not to Wear Travel agents can help you to be in the know of local dress code restrictions. So if a thong is part of your favorite beachwear, you should know that they are illegal in places like the Isle of Palms. 37. Crime Rates Travel experts are great at informing you about questionable parts of town that you may be heading to and can give you tips on what to look out for. 38. Someone to Call if Having a Problem During Your Trip An online travel agency is not going to answer the phone when you call with any complications during your trip. A travel agent continues to give you that personal support even while you are away. 39. When You Shouldn’t Drink the Water We are always told when you travel be careful of the water. Travel agents can advise you on when it is safe and when it’s not safe to drink the water. 40. Small Intercontinental Flights Delayed – What to do? Travel agents can help you find somewhere to stay when you are left helpless at an airport overnight due to flight delays. 41. Saves You Precious Time on Your Trip To avoid 36 hours in the airport, your travel expert can help plan your trip so your time spent getting to where you want to go is the shortest it can be. 42. Anticipating Trouble Travel agents are extremely useful if you are planning a trip to a known weather troubled area such as the hurricane plagued Caribbean islands. In the event of a natural disaster, your travel agent can work to immediately reschedule or cancel your trip so there are no worries for you. 43. Complicated Itineraries Made Simple Travel experts can take care of all the details for those complicated around the world itineraries and all the extra headaches that go with them, such as hotel and transportation along the way. 44. Special Needs Travelers Travel specialists can prearrange any wheelchair or special need that someone in your travel party may have. They can also take the time to make sure your reserved accommodations are safe and easily accessible for the special needs traveler. 45. What to Pack Some activities you choose to partake in may require different layers of clothing throughout the day. Your travel agent can advise you on what to bring. A bike trip down an extinct volcano in Hawaii for example, may require you to start out with jackets and wool socks, but when you get to the bottom you may be down to shorts and a tank top. 46. Let Them Wait on Hold By using a travel agent you no longer have to wait on hold and talk to automated systems while trying to book different parts of your trip. 47. Business Concerns If the airline you are scheduled to use goes on strike or bankrupt while you are traveling, your travel agent can work to find you alternate travel means while you continue to relax at the hotel. 48. Transportation in Smaller Countries Travel agents can arrange all your transportation and travel needs, especially in those smaller countries where you may not know if cabs or van services are safe. 49. Group Hotel Reservations Travel agents can help to keep everyone in your group on the same floor at a hotel. 50. Charter Private Boating Trips Travel specialists can help you to avoid paying top dollar for chartered snorkeling or fishing trips for large groups. They can often find great deals for large groups who want to do personalized tours. 51. Immunizations That May Be Needed To enter certain countries you may be required to obtain certain immunizations first. Your travel expert can advise you on the steps you need to take. 52. Special Deals Worked Out in Advance Travel agents may have a relationship with certain tour operators and could be able to get you a special price that might not otherwise be available. 53. Make Travel Meaningful for Children Travel agents can offer information about kid-friendly activities on your trip to make the experience exciting and meaningful for everyone. 54. Where to Shop Travel agents can offer excellent advice on great shopping neighborhoods in your destination city. 55. Avoid Scams Not all 5 star hotels are treated equally. Many times photos are outdated and information about the hotel you are considering may not be true. Travel agents can make sure that what you are seeing beforehand is what you get. 56. What You Can Buy Later New airline restrictions make packing for long trips hard. Travel experts can give you advice on what you might be able to purchase while you are on your trip to avoid having excess weight in your luggage beforehand. 57. Advice on Where to Go if You Get Sick If you happen to be unfortunate enough to get hurt or fall ill while on your trip, your travel agent can help you find somewhere clean and safe for medical attention. 58. Trust If you should have any questions after booking your trip, you know how to reach your travel agent and can avoid the confusing FAQ section on a website. 59. You Know How to Reach Them When You Need Them Problems at the airport? Reservation issues at the hotel? Your travel agent is a phone call away from getting your problem solved. 60. Tips and Tricks How early do you really need to be at the airport? What are the quickest ways to get through security? Your travel expert can advise you of the airport security levels the day of your trip and any new security checkpoints you may have to worry about. 61. Is the Upgrade Worth It? Your travel expert can help you save money by helping you decide if certain upgrades at hotels are really worth the extra money. 62. Difference in Days to Save Money Instead of playing around with dates on the internet for hours, your travel agent can advise you on any changes to your travel dates that might save you hundreds of dollars. 63. Staying In-the-Know of Daily Promotions Travel agents get emails and faxes of daily money saving promotions. 64. Enhancing the Trip with Extra Amenities Your travel specialist may be able to arrange for those little extras- like a bottle of champagne to be waiting in your room when you arrive. 65. Using Clout in Impossible Situations Whether it is airline seats, cruise reservations, or overbooked activities travel experts have more buying power than the average consumer. 64. Clarifying the Fine Print Your travel agent can advise you of all the cancelation penalties and restrictions hidden in the fine print of your travel documents. 65. Detailed Itineraries Your travel expert can help you plan out your trip day- by -day to give you a good mix of fun and relaxation. 66. Advice on Activities to Book Beforehand A travel expert can forewarn you of any activities that tend to sell out early so there are no unexpected disappointments when you are there. For example, character dining in Disney sells out months in advance. 67. General Ideas on Where to Go A travel expert can offer excellent trip advice based on the details of what type of trip you want to take. Internet booking sites tend to require a destination up front. 68. A Trip to Nowhere…Sort of Want to get away to somewhere that is not normally a vacation hot spot? Your travel specialist can help you find that perfect place. 69. Great Singles Trips A travel agent can help find you exciting singles trips and cruises. 70. What to Pack Your travel expert can give you great advice on what to pack to those exotic destinations. 71. Plan a Trip Where you Bring the Kids but Can Still Get Some Alone Time Many cruises and resorts now offer activities throughout the day for young children that make the day fun for them and give you some time to yourself. Travel experts can help you find great family destination options such as these. 72. Higher Productivity Benefits You have your trip planned while you are hard at work in the office. 73. You Get to be the Boss You get to tell someone what to do for a change. 74. Great Group Trips Trying to organize a trip for big group of people? A travel expert can help get all the details finalized and update everyone in the group. 75. Someone to Complain to If that slim chance were to occur that you do not get what you were promised, you have a real person to go back and complain to. Travel agents will work hard to rectify the matter. 76. They Are Considered Travel Experts and Specialists Wouldn’t you rather have a travel expert plan your trip rather than a preprogrammed website? 77. Best Pre-Seat Assignments Possible Travel agents can talk directly with the airline to arrange for you to get the seats with the most leg room, seats that might not otherwise be released until the day of the flight. 78. Mapping Routes Out Ahead of Time Not really good at reading maps? A good travel expert can help you to map out any basic directions you might need on your trip ahead of time. 79. Family with 3 Small Children and Only Want 1 Room? A travel expert might be able to find a way to help a family with small children get around the hotel policies of only 4 to a room. 80. Help, I’m Lost!!!!!! If you should get lost somewhere along the way, your travel agent could be a good outlet for help. 81. It just Makes Sense to Use a Travel Agent. 82. They’re Out There… Use Them Why do the work if someone else like a travel specialist can. 83. Possibility of a Free Gift Some travel agents offer free incentives. Who doesn’t like the possibility of free presents? 84. Even if the Internet Goes Down Your Trip Can Still Be Planned Your travel agent is still getting your trip planned even if your internet at home or at the office is not working. 85. Back-up Distributor of Documents You can give your travel agent a copy of all your travel documents so if anything were to get lost you have someone to call that can send copies. 86. Because We Said So Our business is to help you find a qualified travel specialist. 87. What to Expect on the Flight Your travel expert can give you helpful answers on what to expect long flights to be like, and maybe some interesting activities to do while flying. 88. It is Their Job Travel agents actually work to get different accreditations to increase their qualifications as a travel expert. 90. Travel Agents Must Be Doing Something Right. They Sure Have a lot of Business Travel agents still sell 51 percent of all airline tickets, 87 percent of all cruises, 81 percent of all tours and packages, 45 percent of all car rentals and about 47 percent of all hotels. * 91. Don’t Like Letter Writing? A good travel agent will send a letter to the airline or hotel for you if you should have a bad flight or poor service at a hotel. 92. Sound Important When Talking About Your Trip After a bragging about a great trip to coworkers or the neighbors, and they ask how you got all those details organized you can say, “My agent did it.” 93. Forbidden Fruit Your travel agent can forewarn you of items not allowed to be brought back into the United States. –Yes, you have to smoke those Cuban cigars before you leave to come home and you can’t bring that “rattling rose apple” back with you from India! 94. Financial Planning Travel experts can help you to create a budget to stick to while you are on your trip, so you can have a good time and not break the bank. 95. Good Babysitters Travel experts might be able to help you find a local babysitter in the area you are traveling to if you want to plan a night out alone. 96. Good Lounge Recommendations Travel specialists can help you decide if purchasing access to an airline lounge is worth it or not. 97. Good Airport Hangouts Travel agents travel a lot. They can probably help you figure out what to do with that extra time you have in an airport after getting through security. 98. Where to Watch Your Wallet More Carefully Although you should always take extra care to hold onto your wallet when traveling, travel agents can warn you if pick-pocketing is common at your future destination. 99. What to Put in the Hotel Safe Travel agents can give you good advice on what you should be keeping in that hotel safe while you are out exploring the sites so there is nothing important missing when you return. 100. Altering Your Travel Arrangements If you have already booked your trip but want to change some details your travel agency can help get all the necessary steps done, leaving you without the headache and confusion. 101. It Makes Traveling Easy Once you find a good travel agent, your dream vacation is just a phone call away. You are currently browsing the TOURIST LIFE TRAVEL & TOUR blog archives for April, 2012.